Massive QE: Death by Insulin Overdose? When one observes the present market volatility one is minded to think of insulin as a metaphor for QE. Insulin, like Quantitative Easing (QE), in large quantities is a killer. Insulin is much more subtle and effective than arsenic or any other fatal poison. When the victim dies because of a deliberate insulin overdose it is difficult to diagnose the cause of their death in a post-mortem. With arsenic or any other fatal poison it is easy because it leaves traces. QE is more like insulin than any other conventional poison. When a given economy suffers horrendously because of a QE overdose, just like with insulin, it is difficult to pinpoint the blame at QE alone. Other external triggers and factors can always be found to take the blame. Massive QE can ultimately lead to extreme financial markets volatility and geo-strategic instability because of erratic currency devaluations. Those can, in turn, lead to trade imbalances as well as regional or global conflict. Let us not forget the 1930s and beggar-thy-neighbour currency devaluation policies. So it is always possible to blame a radical political movement or zealot for starting the conflict when in fact it was the QE insulin overdose that started the snow avalanche. Let us also heed the lessons of the German Kaiser and the Weimar Republic's QE experiment which ultimately manifest as hyperinflation between June 1921 and January 1924. 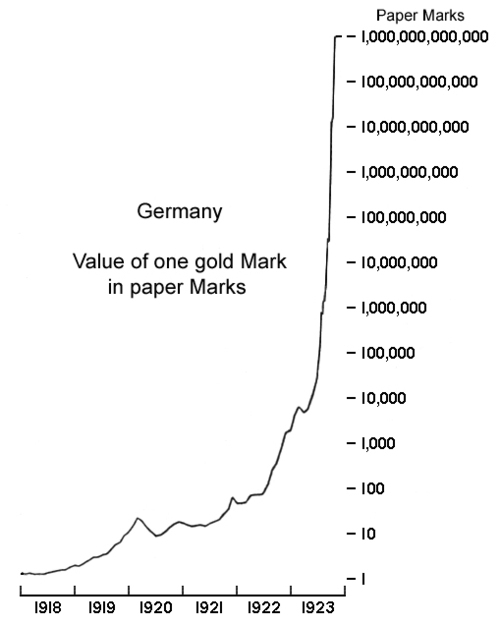 As a result of QE during the First World War between 1914 and 1919, the exchange rate of the German mark against the US dollar fell steadily from 4.2 to 8.91 marks per dollar and kept on falling after that. However by November 1923, each American dollar was worth 4,210,500,000,000 or 4.21 trillion German marks, which weakened the Weimar Republic so much that president Hindenburg assumed emergency dictatorial control over Germany in 1930 paving the way for the megalomaniac despot who assumed control in 1933. In the early 1920s, German economists justified that QE over dose as necessary to monetise government debt and to revive the German economy post the First World War and to pay war damages to the United Kingdom, France and other allies post the Treaty of Versailles. All that monetary indiscipline ultimately led to 'Mein Kampf', the strengthening of the NAtionalsoZIalistische Deutsche Arbeiterpartei (NAZI German workers’ party) and fascism. That fascism spread from Germany to Italy and Spain and across most of Europe under the dominance of Berlin. Are we on a rhyming conflict path in the Asia Pacific region between the US, Japan, China, Koreas etc given the massive QE-induced devaluation of the US dollar and the Japanese yen? On a global scale, the dollar's greater volatility and renewed erratic devaluation witnessed in the recent period is also likely to affect political stability across the world. Food and fuel inflation is linked to the dollar purchasing power which is eroded because of massive QE. Some have traced the Arab-spring and associated Jasmine revolutions with Self-Assembling Dynamic Networks (SADNs) to the last round of dollar devaluation which caused the purchasing power in regard to basic commodities of many emerging market sovereign nations to fall dramatically. On this occasion the consequences may also be felt in the northern part of the Club-Med nations, ie, Southern Europe, Asia and Latin America and perhaps closer to home within the US. Mark Twain once said that history does not repeat itself, it rhymes! Which "New Ode to QE" is being formulated now and how will it end?